While I have no problem with promoting the importance of being a good parent, this billboard left out half the equation – being a mom easily holds an equal (if not greater) ranking in the raising and nurturing of a child. I did not get a chance to see who ran the advertisement, though my guess is that it was a military or quasi-military organization because the father was in his uniform and it’s reference to rank. Given that approximately two million women are serving our nation right now at home and overseas, the billboard’s message seemed woefully short-sighted and downright sexist to me. This entry was posted in feminism, government, Love, military, Sexism, Women and tagged military, parents, women. Bookmark the permalink. 6 Responses to The billboard said what? I suppose you wouldn’t have batted an eye if the word ‘dad’ were replaced with ‘mother’. Humphro, did you assume this was written by a female? It seems “Rick” (the author) is male. Perhaps the word ‘parent’ would have sufficed. Got to disagree. 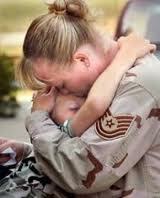 Neither should be considered a higher rank – though moms more often shoulder the greater burden. My only observation would be that for decades now sociologists have lamented the absence of Fathers in the lives of millions of African-American children and the devastating effect it has had on generations of Black youth. I would see some validity in that, but the person portrayed on the billboard was not African-American. Is it any less a problem for Caucasian, Hispanic or Asian children without a Father in their lives?